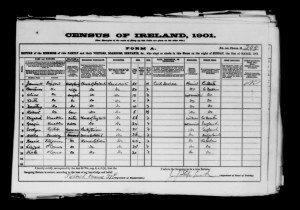 1901 Census form (National Archives of Ireland). Click on the image to view a large image. Dorothy Stopford’s family were a wealthy middle class Protestant family who were based in south Dublin until her father Jemmett Stopford died in 1902. The 1901 Census records the Stopford family as living in Terenure and was completed by Jemmett who lists his wife, Constance; their three daughters, Alice, Edith and Dorothy; and their youngest child, Robert. Jemmett’s sister, Elizabeth Venables and her daughter, Georgie were also present that night. They were clearly a prosperous family as they had a governess for the children and a number of domestic servants. By the time the 1911 Census was taken, the family had moved to London. Jemmett had worked as an accountant to the Irish Land Commission, part of the British civil service in Ireland. His father Edward Adderley Stopford was Rector of Kells and Archdeacon of Meath, and his grandfather was Edward Stopford, the Church of Ireland Bishop of Meath. Jemmett Stopford’s wife, Constance Kennedy, was the daughter of Dr Evory Kennedy, Master of the Rotunda Hospital from 1833-1840. Alice Stopford Green (nÈe Alice Sophia Amelia Stopford), photograph by Henry Herschel Hay Cameron (later The Cameron Studio), 1880s. Alice Stopford Green, Jemmett’s sister, went to London in 1874, where she married pioneering social historian John Richard Green in 1877. He died six years later in 1883, and by this time Alice had become an accomplished historian herself. 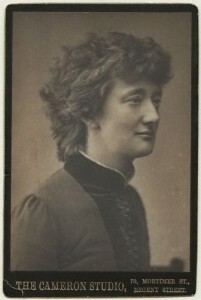 She became interested in Irish history and the nationalist movement, partly through her opposition to English colonial policy in South Africa during the Boer Wars. She supported Roger Casement’s Congo Reform movement, and set up the Africa Society to help further his aims. Her 1908 book, The Making of Ireland and its Undoing, argued that the native Irish culture was rich and sophisticated, and that the Irish were not the savage and ignorant people who had had to be civilised by the British, as many British texts contended. Stopford Green was one of the people who tried to make the prospect of Home Rule in Ireland more attractive to Ulster Unionists, who vehemently opposed it. She was closely involved in the Howth gun-running which brought arms into the North Dublin port in 1914 to be used by the rebels in 1916. Her house at 90 St Stephen’s Green became an intellectual centre for Irish nationalists. She supported the pro-Treaty side in the Irish Civil War and was among the first nominees to the newly formed Seanad Éireann in 1922, where she served as an independent member until her death in 1929.